To deepen their understanding of Muslim societies, nine journalism students from the University of Illinois are reporting from Turkey under the direction of Professor Nancy Benson and with the advice of the IHT’s Susanne Fowler. The first story, an interview with Ahmet Sik, a Turkish journalist and author recently released from prison, was filed from Istanbul by Latifah Al-Hazza. The second story, posted today from Antioch, Turkey, was written by Tuli Taiwa about her experience as a black woman in Turkey. This University of Illinois international reporting field program is funded by the Social Science Research Council (SSRC). This project focuses on Turkey’s central role in determining the trajectory of the global Muslim revival and its growing political and economic influence in the larger Middle East. 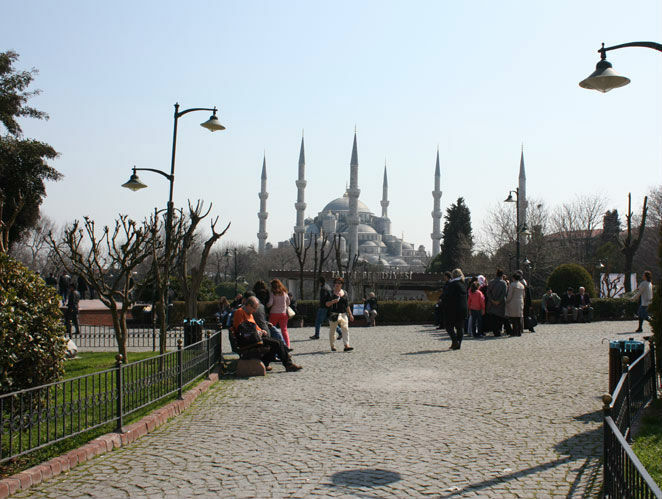 It has featured a semester-long seminar on Turkey for journalism students in Spring 2012, culminating in a three-week field reporting assignments in Turkey. The SSRC grant was awarded to the Centre for Global Studies, a U.S. Department of Education Title VI National Resource Center (NRC), who collaborated with several UIUC units including the European Union Center, on this grant. Associate Professor of French and EUC-affiliated faculty member Marcus Keller was interviewed by Illinois International about the recent French elections. He discussed their significance for France and the European Union at large. Read Professor Keller's full interview below or by clicking here. Marcus Keller is an associate professor in the Department of French at Illinois. A specialist of early modern French literature and culture, he is the author of Figurations of France: Literary Nation-Building in Times of Crisis, 1550-1650 (Newark: U of Delaware Press, 2011), as well as articles on Rabelais, Montaigne, and Corneille among others. Further research and teaching interests include French and European theater and performance studies, and the appropriation of early modern literature and culture in contemporary arts and philosophy. Here, Prof. Keller discusses the recent French Presidential election, held in two rounds on April 22 and May 6, which saw François Hollande defeat incumbent Nicolas Sarkozy. A member of the French Socialist Party, Hollande’s victory suggests a significant shift in the political leanings of the French people. What would you consider some of the causes of this national shift toward the left? I don’t think that the election results reflect a major shift of France’s population toward the left. Consider the outcome of the second round: François Hollande won by a very narrow margin, just over 1.1 million votes or 3% of the electorate. This indicates above all that the country is equally split between the left and the right, not unlike what we have been seeing in the U.S. in recent years. In terms of the actual political landscape in France, the first round of the presidential election was much more revelatory. With 17.9 % of the vote, Marine Le Pen, candidate of the extreme right Front National, scored the best result ever for her party in a presidential election. While Jean-Luc Mélenchon, leading a movement positioned on the left of Hollande’s Socialist Party, came in fourth with 11.1 % of the vote, François Bayrou, the candidate of the centrist MoDem party, had his worst showing so far (9.1 %). In other words, the big shift that we have seen in this election is one to the extremes of the political spectrum, expressing the frustration of large parts of the population with the political establishment and the direction their country is taking. Let’s not forget that, during the second round, invalid protest votes outnumbered those that gave Hollande the decisive advantage over Sarkozy. We will probably see this move of the electorate from the center towards the margins reaffirmed during the parliamentary elections on June 16. Hollande ran under the promise of being a “normal” president. What are some of the “abnormalities” that cost Sarkozy the election? The presidency of Nicolas Sarkozy has brought to light that the French still expect their president to be a dignified leader who stays above the fray of daily politics to make only decisions of national importance, and secures France’s influence internationally. Early on Sarkozy was perceived as “hyper-active,” making several public appearances a day, personally dealing with political matters of all sorts while committing more than one highly publicized verbal faux pas along the way. I was struck by the degree to which the French seemed to take issue with Sarkozy’s style even if they agreed with his policies. I often heard people qualify Sarkozy as “vulgaire,” an epithet that carries a much heavier weight in French than in English. In essence, in the eyes of many, Sarkozy had violated too often French common notions of decency, restraint, and—the most elusive of all—good taste. At the beginning of the presidency, Sarkozy wearing Ray Bans while publicly promenading with his new wife, ex-model and singer-songwriter Carla Bruni, and other such episodes dominated the headlines for weeks and created an image that stuck with him, no matter how much he tried to deflect it. When François Hollande made “normalcy” the catchword of his campaign, he indirectly made the promise that with him the French presidency would no longer be marred by the perceived extravagance and missteps of the sitting president, and that he would restore the stability and dignity that the French expect of the highest office, especially during turbulent, “abnormal” times. Hollande has been critical of German-led austerity measures in the European Union. In fact, German Chancellor Angela Merkel publicly supported Sarkozy. What effect could Hollande’s election have within the EU? With the arrival of François Hollande at the Elysée Palace, Europe’s proponents of economic growth through public spending have a new figurehead. In fact, Hollande has already galvanized the opposition to German-led austerity policies in the E.U. that were supported by Nicolas Sarkozy. However, Hollande and Merkel will have to find a middle ground soon because a prolonged disharmony between the two countries would be perceived as a source of unneeded further instability in the E.U. A compromise already seems to crystalize: both leaders acknowledge the necessity of continued austerity but also emphasize the need to stimulate growth. As the recent G8 summit and in high-level talks in Brussels have shown, though, there are considerable disagreements between France and Germany about how to reach these goals, and it remains to be seen how and when Hollande and Merkel will arrive at a compromise. One of the biggest issues in France is immigration. Where does Hollande stand on this issue, and how does that differ from Sarkozy? Contrary to Nicolas Sarkozy, who took a tough, polarizing stance on immigration and ran the last days of his campaign on the theme of closing national borders to lure voters away from his far-right opponent Marine Le Pen, Hollande presented himself as the candidate of national reconciliation and integration. As a first concrete measure, he proposed to give immigrants the right to vote on the local level. Throughout his campaign, Hollande emphasized the importance of addressing the issue of economic inequality, afflicting all French alike, regardless of their background. Unlike Sarkozy and Le Pen, the latter running on a crude anti-immigration platform, Hollande defused the problem, warning of the demagogic exploitation of immigration and refusing to go down the path paved by the Front National. Much like in the U.S., a major issue in the French presidential campaign was the struggling economy. How does Hollande propose fixing the French economy? François Hollande has declared that he wants to balance the national budget within the next five years. He also wants to stimulate the economy immediately by creating more public sector jobs, especially in education, after years of cutting under Sarkozy, financed by a tax increase on the wealthiest to up to 75%. The first measure his government took was to slash their own salaries and those of other senior officials, including the president’s, by 30% effective immediately. While this measure was largely symbolic, it set the tone of Hollande’s presidency: a return to more economic equality and social cohesion. Hollande has also vowed to make the continuous problem of high youth unemployment, currently hovering at above 20%, one of his priorities. It remains to be seen if and how France’s new president will make good on his promises in a climate of sluggish growth and increasing international uncertainty about the European debt crisis. Contrary to his opponents’ predictions, though, the French stock market did not plummet the day after Hollande’s victory. The European Union Center congratulates the first six graduates from its Master of Arts in EU Studies—the first six people to receive such a degree in the United States. On May 12, EU studies students Bergen Bassett, Adam Heinz, Alexandra Lively, Katie O'Dowd, Lauren Turk, and Erik Vickstrom participated in a University of Illinois at Urbana-Champaign commencement ceremony. Their degree prepares them for work in areas ranging from government to trade to think tanks. These students have made the most of their studies: they studied abroad at various European universities in countries like France, Portugal, and Spain; all of them received Foreign Language and Area Studies (FLAS) fellowships to support foreign language study; and they produced master's theses and substantial research projects delving deep into issues faced by the European Union. 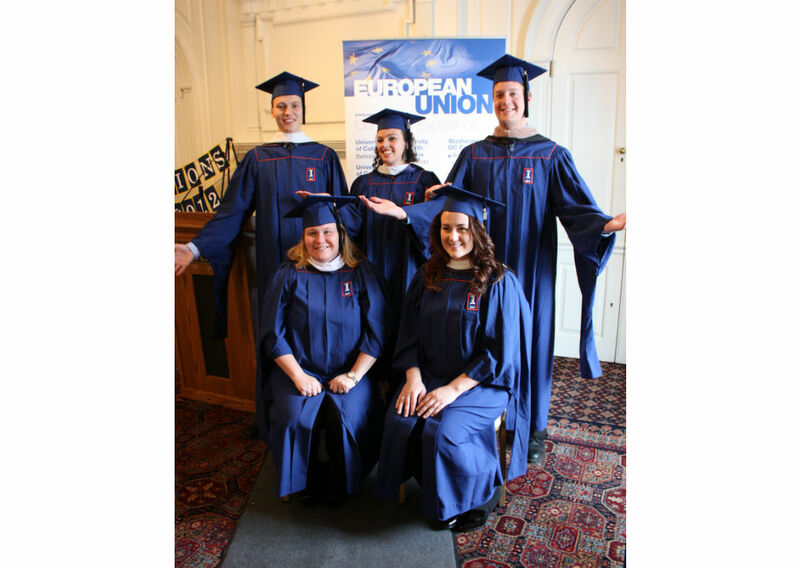 Such experience and knowledge will allow these graduates to pursue successful careers, with constant ongoing support from the European Union Center. In addition, the EUC congratulates Gabriela Walker, who received her PhD in Educational Policy Organization and Leadership with a graduate minor in EU studies. Gabriela's doctoral thesis is entitled “From the Human Rights-Based Approach to an Ecological Approach on How to Achieve Successful Inclusion in International Disability Education,” and included analysis of EU educational rights provisions for people with disabilities. Dr. Turkina represented Dr. Kourtikakis and herself at the conference, held in Ottawa, Canada, April 27-28, 2012. Their paper was given as part of a panel on the European Neighbourhood Polcy – East and South. 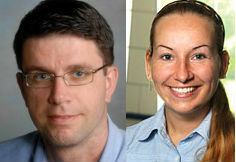 Every two years, the ECSA-C organizing committee selects three conference papers for prizes. Dr. Kourtikakis’ and Dr. Turkina’s paper stemmed from research funded by the University of Illinois European Union Center’s European Union Center of Excellence grant, which is administered by the Delegation of the European Union to the United States. Dr. Kourtikakis’ and Dr. Turkina’s project is entitled “Network Governance in the European Union: The Role of Administrative and Foreign Policy Networks.” Along with their project research, which will continue next year, Kourtikakis and the European Union Center will host an international symposium on EU Administrative and Foreign Policy networks. Kourtikakis’ and Turkina’s research also overlaps with the EU Center’s EU-funded Jean Monnet course module on the EU and the Mediterranean. Dr. Kourtikakis is both a faculty affiliate for this program, as well as the 2012 course leader. 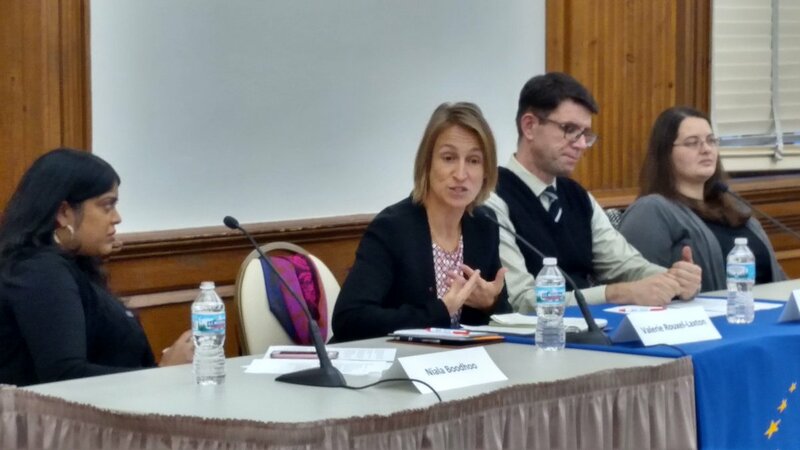 For more information about Dr. Kourtikakis’ recent contributions on EU-related topics to the EU Center and larger University of Illinois community, search the EU Center’s blog here. CHAMPAIGN—The European Union Center at the University of Illinois is pleased to announce that the European Union Center of Excellence (EUCE) at the University of Pittsburgh has been awarded the EUCE Outstanding Outreach Activity Award for its 2011 Model European Union program for high school students. The EUCE Outstanding Outreach Activity Award was initiated by EU Center Staff at Illinois to increase the awareness of excellent outreach projects conducted by the ten EU Centers of Excellence located throughout the United States. 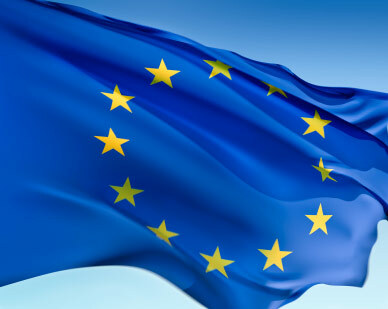 “We are especially proud of this award because Pitt’s Model EU simulation is an EUCE team effort and because it is awarded by a committee made up of diplomats,” said Ronald Linden, director of Pitt’s EUCE/European Studies Center and a professor in the Kenneth P. Dietrich School of Arts and Sciences’ Department of Political Science. Thompson and Assistant Director Steve Lund. 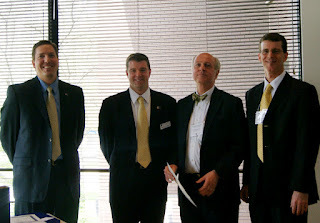 The review committee—comprising representatives from the Polish embassy (Maciej Pisarski, Deputy Chief of Mission), the Austrian Consulate in Chicago (Consul General Thomas Schnöll), and the Delegation of the European Union to the United States—acknowledged the success of Pitt’s submission for the award. Pitt’s EUCE, along with the submitted activities of six other centers, will be featured in promotional materials to be distributed domestically and throughout the European Union in an effort to promote EUCEs in the United States. 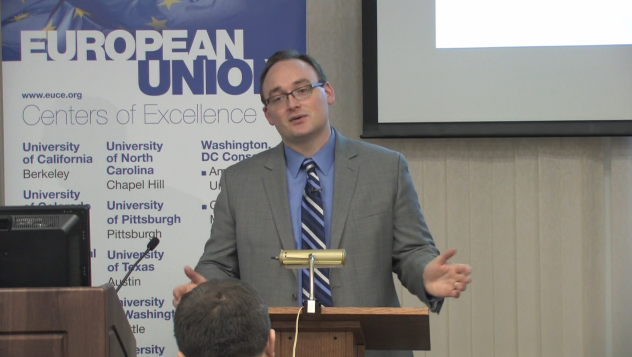 In December 2011, more than 100 students in grades 9-12 from nine Pittsburgh-area schools participated in the University‘s day-long Model EU simulation. 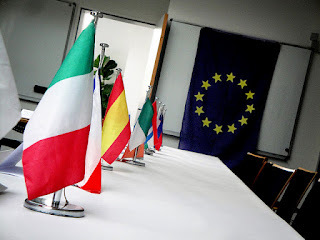 This is the most recent of these annual events, which provide students with an opportunity to learn about the workings of the European Union through role-playing activities. 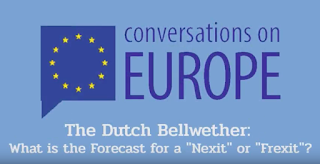 Students assume the roles of presidents, prime ministers, and foreign ministers and engage in intense negotiations over controversial issues facing the EU. Established in 1998 as the result of a first-of-its-kind national competition, Pitt’s EUCE has successfully received renewal with each subsequent national competition. Ten U.S. institutions of higher learning were designated as Centers of Excellence in 2011 and will receive funding support through 2014. The European Commission funds the EUCE initiative as part of a broader effort to promote people-to-people ties across the Atlantic. For more information about Pitt’s EUCE, visit www.ucis.pitt.edu/euce. 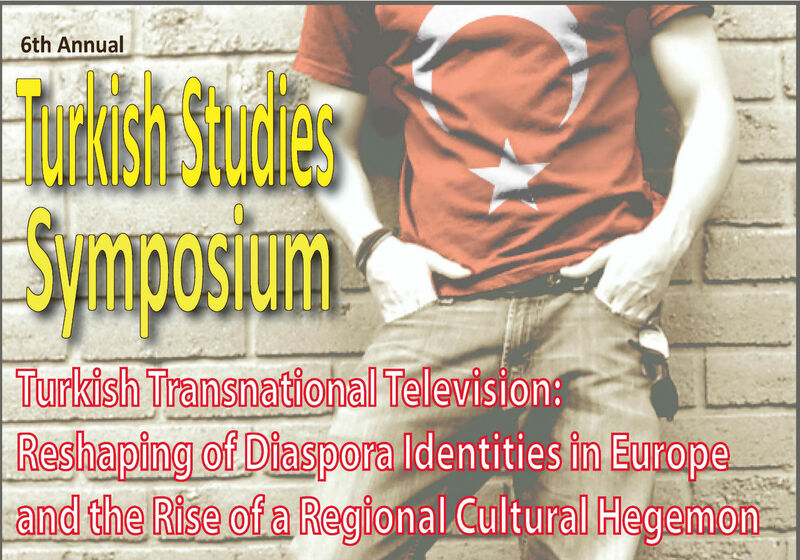 On April 27, the European Union Center hosted the Sixth Annual Turkish Studies Symposium: Turkish Transnational Television - Reshaping of Diaspora Identities in Europe and the Rise of a Regional Cultural Hegemon. 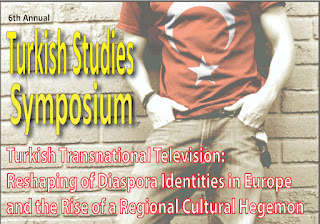 The symposium consisted of two panel discussions discussing "the complex connections between media use, cultural belonging and worldviews" as they relate to the transnationalization of Turkish television. Check out videos from the symposium below. Beyazit Akman has received his Ph.D. in English literature and culture at Illinois State University. He did his M.A. as a Fulbright Scholar from Turkey. In his doctorate scholarship he has focused on (mis)representations of Islam in the Western discourse from late Renaissance to the post-9/11 era. Watching Soap Opera in the Diaspora: Cultural Proximity or Critical Proximity? Myria Georgiou teaches at the Department of Media and Communications at the London School of Economics. Dr Georgiou’s research focuses on the ways media shape discourses of identity and citizenship within transnational and urban contexts. Dima Issa is a lecturer of Mass Communication at the University of Balamand in Lebanon. She has an MSc from the London School of Economics in Global Media and Communications and an MA from the University of Southern California in Global Communications. Her research at both institutions focused on the roles of media in the construction of identity within transnational audiences. 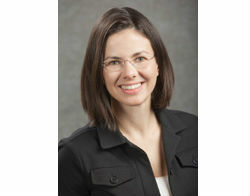 CHAMPAIGN—The European Union Center at the University of Illinois is pleased to announce that Dr. Katerina Linos is the 2011 recipient of the Larry Neal Prize for Excellence in EU Scholarship, for her article “Diffusion through Democracy,” published in the American Journal of Political Science (55.3). The Larry Neal Prize was initiated by the EU Center at Illinois to recognize excellent research conducted by affiliated faculty of the ten EU Centers of Excellence located throughout the United States. 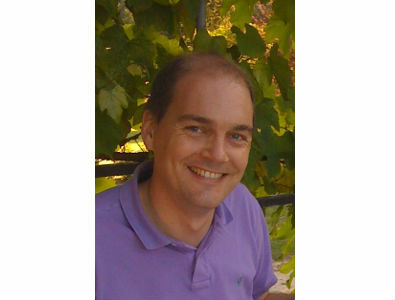 Dr. Linos’ article was nominated by the European Union Center of Excellence at the University of California, Berkeley. Dr. Linos is an Assistant Professor of Law at Berkeley and holds degrees in Law (J.D.) and Political Science (Ph.D.) from Harvard University. 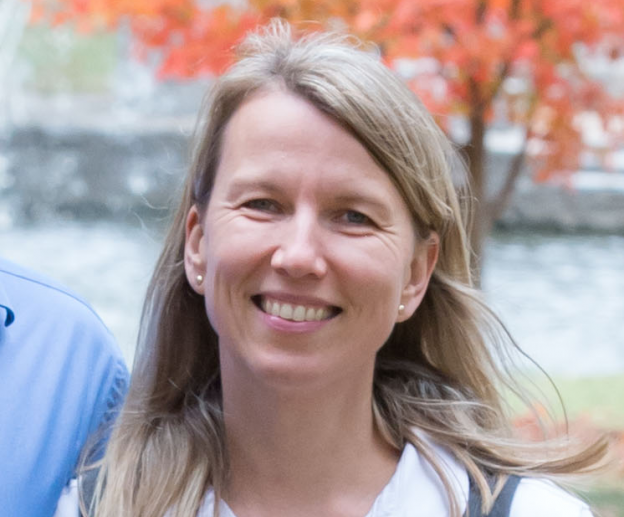 As part of her award, the EU Center has invited Dr. Linos to give a public lecture at the University of Illinois on her award-winning article. The lecture will take place on October 5, 2012. In honor of Professor Emeritus of Economics Larry Neal, the founding director of the European Union Center at the University of Illinois, the EU Center created the “Larry Neal Prize for Excellence in EU Scholarship” through the generous funds from the European Commission’s European Union Center of Excellence grant. Each year the Center solicits submissions of both books and articles that address current issues faced by the European Union and in EU-US relations. Submissions are encouraged from all disciplinary fields. Congratulations to our Visualize the EU Contest Winner! The European Union Center is pleased to present its winner for the 2012 Visualize the EU Contest: Amanda Morales, a University of Illinois junior in Industrial Design. For the contest, whose theme was "Seeking Sustainable and Secure Connections in Food, Energy, and Governance," Amanda created a video in which she explains the European Union as she illustrates on a whiteboard. Amanda's prize is a place on the EUC's 6-day study tour to Europe this June. Check out the winning video below! 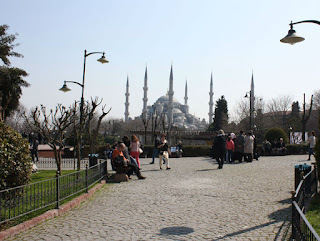 A May 2 UIUC News Bureau article discussed EUC-affiliated faculty member Nancy Benson's upcoming International Reporting class, which heads to Turkey on May 15. The course, which gives students the opportunity to serve as foreign correspondents, is funded primarily from a Social Science Research Council grant, the result of a collaboration between the European Union Center, the Center for Global Studies, and Professor Benson. Check out the full article below or by clicking here. CHAMPAIGN, Ill. — Four classes, four continents. About every two years, a small class of University of Illinois journalism students under the supervision of professor Nancy Benson reports from a different part of the world, taking a two-week turn as foreign correspondents. In 2005 it was Peru. In 2007, China. Then Romania, with a stopover in Italy, in 2009. For this year’s all-female crew of nine, the destination is Turkey. They arrive in Istanbul on May 15. Readers may be able to follow some of their work through the International Herald Tribune, as well as later on WTTW-Channel 11 (PBS) in Chicago. Their trip may be the most timely of any so far. The “Arab Spring” erupted just a year and a half ago, and many in the Middle East have looked to Turkey as a model for mixing Islam and democracy. And in post-9/11 America, Muslims continue to be seen often as only “Arabs who want to do us harm,” Benson said. In fact, unlike previous classes, Benson said, this spring’s version of Journalism 470 (International Reporting) is as much about a religion as a country. The main funding comes from the Social Science Research Council, in a grant focused on raising awareness among journalism students about Islam and the portrayal of Muslims. Turkey was chosen because it is considered a safe place to travel, a focus of global attention, and a crossroads between the West and the Islamic world, Benson said. All of the students’ efforts, including blog posts and stories, will be available online and can be followed through the Twitter handle @uiglobalreports. The students on this reporting trip also will benefit from the help of two professional journalists traveling with them for all or part of the trip. Susanne Fowler, an editor with the International Herald Tribune who has worked in Turkey, will join them at the start of the trip. Benson knows her from when they were reporters in Chicago. Halfway through the trip, they also will be joined by Ash-har Quraishi, a former CNN bureau chief in Pakistan who now is a correspondent for “Chicago Tonight,” broadcast on WTTW. Quraishi, a Chicago native, is a 1997 Illinois journalism graduate and a former student of Benson’s. “He’s a very valuable alum in this particular situation,” given that he is an American Muslim with experience as a foreign correspondent in an Islamic country, and yet young enough that students might relate to his experience, Benson said. For WTTW, two students’ story ideas have been selected for development, but likewise there’s no guarantee they will result in something for broadcast, she said. Benson would like to be able to say she planned this year’s class in response to the “Arab Spring,” but that’s not the case. Picking a destination is often a “backward process,” determined mostly by funding, she said – though she also works to spread the destinations around and avoids developed countries. “I’m interested in going where the action is happening now, where the country is still developing, where there are lots of important issues that are still being decided,” she said. What that means, however, is “starting from scratch” every time, Benson said – new territory, new issues, new contacts. In preparing her students, Benson brings in experts from the campus and elsewhere to discuss the country they will be traveling to and the issues they might be dealing with. For this trip, they also visited the Central Illinois Mosque, near the edge of campus in Urbana, to observe a prayer service and hear a panel discussion. Benson always travels to the country ahead of time, usually over spring break a couple months before the trip. She finalizes accommodations and travel plans, but also contacts potential sources, and arranges meetings with academic experts and foreign journalists. She also lines up journalism students in the country, asking them to work with her students on stories, as translators and to provide a different perspective. That may be more difficult this time, she said, because of the timing of Turkish students’ exams. Even with all this preparation, however, the students will still be dropping into a foreign place and will still find plenty of challenges, Benson said. Their original story may not work out as planned. (They’re urged to have a plan B and C.) They may face significant roadblocks. And they’ll have to work together, even while working on their individual stories. “This experience is so intense that they really do bond in ways that you don’t in a regular classroom setting,” Benson said. On April 25, Her Excellency, Marina Kaljurand, Ambassador Extraordinary and Plenipotentiary of Estonia to the United States, visited the University of Illinois at Urbana-Champaign and delivered a talk entitled "Estonia's Experiences Prior to and Since Integration into the EU." Ambassador Kaljurand's talk was part of a European Union Center event called Estonia's Singing Revolution. The talk was followed later that evening by a screening of the documentary, The Singing Revolution, itself followed by a panel discussion by Jim Tusty, producer of the film, and Carol Leff, professor of political science at UIUC. You can watch Ambassador Kaljurand's full talk below or by clicking here. Marina Kaljurand has previously served as Undersecretary for Foreign Economic Relations and Development Aid in Estonia (2008-2011), and Ambassador to the Republic of Kazakhstan, among other posts. On April 25, the European Union Centered sponsored a visit by Her Excellency, Marina Kaljurand, Ambassador Extraordinary and Plenipotentiary of Estonia to the United States. 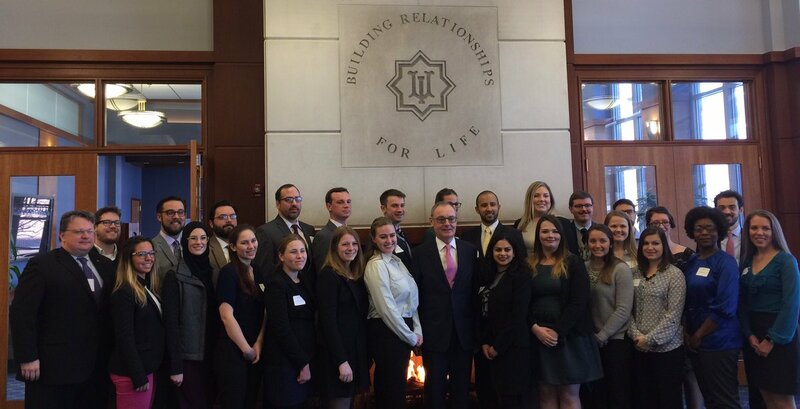 Sarah Shaw of UI-7 News, the University of Illinois at Urbana-Champaign's student-run television and radio news broadcasting organization, produced a report about the Ambassador's visit. Check out the report below or by visiting the UI-7 News Vimeo page.